Welcome to the first edition of our “WordPress Products, Audited” series. We’re thrilled (yes, thrilled!) 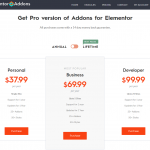 to launch this series which will enable us to help WordPress theme and plugin developers to optimize their products (this time it’s ‘Elementor Addons’) for more sales & conversions in all possible aspects. The article WordPress Products, Audited: The Case-study Of ‘Elementor Addons’ by LiveMesh appeared first on Freemius.